Home > Small-molecule targeting of brachyury transcription factor addiction in chordoma. 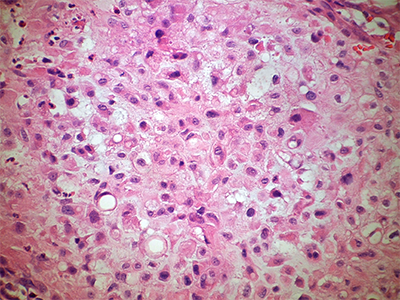 Chordoma is a primary bone cancer with no approved therapy1. The identification of therapeutic targets in this disease has been challenging due to the infrequent occurrence of clinically actionable somatic mutations in chordoma tumors2,3. Here we describe the discovery of therapeutically targetable chordoma dependencies via genome-scale CRISPR-Cas9 screening and focused small-molecule sensitivity profiling. These systematic approaches reveal that the developmental transcription factor T (brachyury; TBXT) is the top selectively essential gene in chordoma, and that transcriptional cyclin-dependent kinase (CDK) inhibitors targeting CDK7/12/13 and CDK9 potently suppress chordoma cell proliferation. In other cancer types, transcriptional CDK inhibitors have been observed to downregulate highly expressed, enhancer-associated oncogenic transcription factors4,5. In chordoma, we find that T is associated with a 1.5-Mb region containing 'super-enhancers' and is the most highly expressed super-enhancer-associated transcription factor. Notably, transcriptional CDK inhibition leads to preferential and concentration-dependent downregulation of cellular brachyury protein levels in all models tested. In vivo, CDK7/12/13-inhibitor treatment substantially reduces tumor growth. Together, these data demonstrate small-molecule targeting of brachyury transcription factor addiction in chordoma, identify a mechanism of T gene regulation that underlies this therapeutic strategy, and provide a blueprint for applying systematic genetic and chemical screening approaches to discover vulnerabilities in genomically quiet cancers.